The Student Senate began its meeting with new Police Major Michael Jagoda. Jagoda is a former Connecticut State Police Commander with more than 22 years of experience. Jagoda said his focus is on the issues with the relationship between students and the police force. He explained that he wants to increase the rate of engagement the police force has in the community. Jagoda said he wants more student input with policing. He wants to know what the university police are doing right and what they are doing wrong. He also wants to make the community a safer place where students are not afraid, especially with the newly-armed police. Jagoda is making the police force go through National Guard leadership training amongst other extensive training programs. Another issue Jagoda is currently tackling is the Safe Ride program. Jagoda wants to make the Safe Ride program more open and more comfortable. He recently got new SUVs, specifically used for the Safe Ride program, to make students feel more comfortable compared to being driven in the back of a police cruiser. He also has certain officers on shifts just to provide safe rides for students to make sure they will have someone available when they are needed. Senate ended by talking about the growing concern over the Narragansett housing controversy. 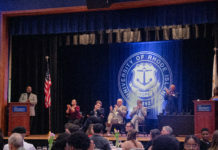 Recently the group that has been trying to make it harder for students to live off-campus, and to change laws for URI students living in Narragansett, is in discussion for changing their legislation. The changes would be that URI students could only have three or less students to lease a house. Anything more than three would result in the landlord having to apply for a special permit. The second change would be to the social host violation. Anyone under 21 having a party in Narragansett would be fined $500, on top of their parents and landlord being fined. Senate is advocating for an increased role of students in the process to fight this legislation from going through.